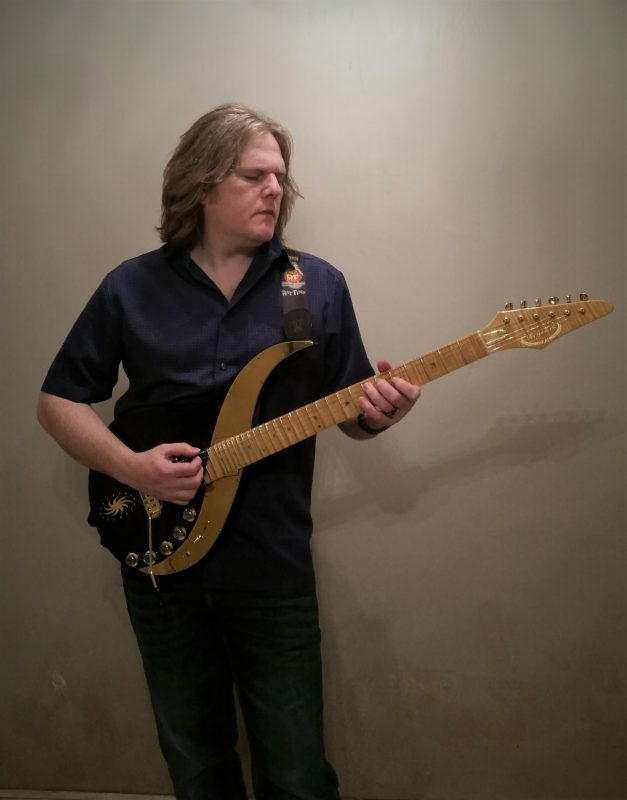 “For me the opportunity to own a Sky Guitar was the realisation of a dream come true. I remember when the Sky Guitar first appeared around the time of ‘Beyond the Astral Skies’ and seeing Uli perform on that tour left a huge impression on me. Many years later when Uli announced he would be making a limited number of these guitars available I knew I had to realise my dream of owning one. By then I was deeply passionate about the guitar and the qualities of the Sky Guitar appealed to me on many levels. A key feature of the Sky Guitar is obviously the extra frets and this was initially the main attraction for me, mainly because of wanting to play violin pieces and being inspired by Uli’s version of Vivaldi’s ‘Four Seasons’ and his ‘Transcendental Sky Guitar’ work. This work had a massive impact on me by opening my mind up to what was possible with such a guitar. I am now proud to own number serial number 9 ‘Black Velvet Sky’ which is a 6 string with an exquisite quilted maple top and alder body This is unlike any other guitar I have ever owned both in terms of its opulent beauty and also its unique design and elegant functionality. The craftsmanship is simply stunning with unbelievable attention given to every detail. It really is something extra special. However, despite its striking aesthetic appeal is not merely a collector’s piece. The heart of this instrument is its playability and impressive tonal voice. It is an extremely comfortable instrument to play. I already loved scalloped necks, so immediately felt at home with this neck, but the quality of maple far surpasses any of my previous guitars and is definitely the finest I have seen. The engine room of its tonal character is the innovative Mega-Wing pickup system which enables a wide ranging sonic palette of tones, from ‘bell and chime’ single coils to rich and warm brown sound humbuckers. The tone controls are vastly superior to the normal fare and facilitates an immense amount of control to the player. This feels so much more incisive than relying on pedals to adjust the amount gain required during a performance. This guitar was born to sing, with every note being a joy to control and manipulate. It inspires me to play better.